Department responsibilities: State strategic planning; legislative consultation on IT policy issues; IT policymaking; creation and implementation of technology standards, rules and guidelines; operation of the state portal; state telecommunications operations; state security operations; state data center operations; technical assistance white papers; e-procurement project management; commodity hardware and software procurement through volume purchasing. As chief information officer of Pennsylvania from 1995 to 1999, Larry Olson helped the state save more than $270 million by consolidating data centers, putting telecommunications services under one contract and building a common e-mail platform for state government. He has even greater plans for transforming Texas, which spends roughly $2 billion annually on information technology. "I consider what we did in Pennsylvania as practice for what are going to do in Texas," said Olson, who in April accepted the post as Texas' chief technology officer and executive director of its Department of Information Resources. "We're going to do better in Texas, because this is my home state." But just ask anyone who knows how Texas government is structured, and they will tell you Texas isn't Pennsylvania. Unlike the Keystone State, Texas has a governor with no cabinet, a strong legislature and independent agencies overseen by governing boards -- just the opposite of Pennsylvania. Rather than being directly accountable to a member of the governor's cabinet as he was in Pennsylvania, Olson reports to a seven-member governing board assigned to oversee his agency. "The Texas state government is run much more by the legislature, and Larry is faced with the challenge of how to build and maintain support from a legislative body with a weak governor's office," said Tom Davies, senior vice president for the consulting firm Current Analysis Inc., Sterling, Va. He also will have to grapple with the independent boards and commissions that govern many of Texas roughly 250 agencies. "Texas has dispersed authority compared to other states," said Bob Campbell, U.S. public-sector leader at New York-based Deloitte. "Most of the power lies in independent boards and commissions. It creates extraordinary constraints and challenges to do things on a true enterprisewide basis." For these reasons, Olson faces a tough challenge getting state politicians and agency officials to cooperate on an enterprise approach to IT and make the changes necessary to bring about hundreds of millions of dollars of savings. Yet those who either worked alongside him in Pennsylvania or who are familiar with his work there said Olson is equal to the task. Olson's strength lies in his ability to establish a tightly focused, statewide IT strategy and organize stakeholders to achieve those objectives, they said. "In Texas, unlike in Pennsylvania, there is not a clear line of authority for who is in charge about anything, including IT," said John Kost, managing vice president for worldwide public-sector research at market research and consulting firm Gartner Inc. in Stamford, Conn. "But Larry's political instincts will play to his advantage by enabling him to persuade key lawmakers and others to join the cause." Current Analysis' Davies agreed. "[Olson's] track record in Pennsylvania speaks for itself. He has been one of the few state technology leaders to successfully consolidate multiple data centers, implement an enterprisewide software model and bring statewide visibility to the CIO leadership role," he said. Olson seems unfazed by the challenges. He is aware the political playing field is not the same in Texas as it was in Pennsylvania, but said his job essentially is the same: Produce results that satisfy the governor and the legislature. "If one or the other is not happy with you, then your life is miserable," Olson said. "So I don't see much difference." Before taking the Texas job, Olson was a principal with Aligne Inc., the Wayne, Pa., IT management consulting firm he joined after serving as Pennsylvania's CIO. Olson said his discussions with the Texas board when he interviewed for the position made it clear that both the governor and legislature wanted him to take the department to the next level -- and that they would support him. "They want it to become more of an activist and be aggressive about adding value to the process," he said. One of Olson's first moves when he took over as Texas CTO was to develop a strategic IT plan similar to the one he established for Pennsylvania nearly a decade ago. In a planning report published May 28, Olson set forth a plan of action with 14 short-term deliverables in five areas that would precede execution of a statewide, shared IT infrastructure. The report, "A Foundation for Change," noted that nearly 90 percent of the $2 billion that the Lone Star State annually spends on IT is deployed on an agency-by-agency or project-by-project basis, and would benefit greatly from coordinated enterprise management. The Texas Department of Information Resources plans to focus the bulk of its effort on data center and network services consolidation and building a statewide foundation for voice over Internet protocol, he said. As part of his commitment to implement an enterprise IT approach, Olson said he told agency heads that he was going to push them to support his agency and its goals. At the same time, he pledged to include them in all of the planning and work that he will do with them. "I will include the agencies as part of this, because that's the only way to build a public enterprise. We're not going to sit in an Ivory Tower and decide what is best for them just because we are the ones that deliver the services," he said. Olson wants companies interested in doing business with his department to understand the direction it is headed and to offer creative proposals for ways to reach the goals and objectives outlined in the strategy report. Those that win contracts will get national attention from working with a leader in the government IT field, he said. "I've made it clear to our current and prospective partners that we are going to be a major center of trends and leadership nationwide," Olson said. "We will come up with new ideas and deliver on them and their benefits. It is not going to be just talk. It is going to be execution. Our partners will be associated with a national leader." Olson's style is quite different from his predecessor Carolyn Purcell, said analysts and former state CIOs who knew Olson when he served as Pennsylvania CIO. Purcell succeeded despite the absence of a strong governance structure, largely on the strength of her negotiation skills, they said. Some said Olson can be abrasive. They also claimed he turned his back on the Lexington, Ky.-based National Association of State Information Resources Executives when he was Pennsylvania's CIO, because he didn't agree with the direction the organization was taking on federal and state IT relations, such as handling Y2K planning. "I never viewed [Olson] as a constructive entity," said a former CIO who asked to remain anonymous. "He was not popular at all among the CIOs. He wanted to have more influence than anyone would give him and he was out of step with everyone else." Olson acknowledged that he candidly expressed his opinion about how state CIOs should work with the federal government in addressing Y2K issues, saying he was up front with his feelings. "That's my management style," he said. Some NASIRE members also became upset when Pennsylvania scheduled a national conference for federal and state CIOs in Pittsburgh leading up to Y2K. But Olson said he did not have a competing agenda. "I just didn't see anything happening. It looked like we needed a catalyst. The clock was ticking," he said. "My bottom line was delivering results for Pennsylvania." Olson also said NASIRE was included in the Pennsylvania conference, and he continued working with the organization. He intends to do so now, he said. 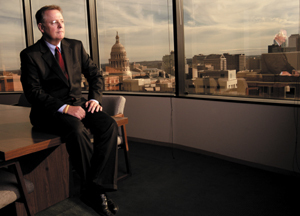 Olson's management style drew praise from several analysts, who emphasized that he is accountable to Texas, not to the organization now known as the National Association of State Chief Information Officers. "Larry doesn't need NASCIO," Kost said. Although the organization serves a valuable networking role for new CIOs, for "someone as experienced and talented as Larry, NASCIO is not essential for his success," he said. Davies agreed. "Larry wasn't afraid to break some eggs when he was in Pennsylvania," he said. "Nor did he rely very much on the council of his peers in other states. "He is a change agent who isn't wedded to the past or tradition," Davies said. "I would be surprised if he changed his style. He seems to have an intuitive sense of how to use all the levers of power available to a CIO to get the job done." If Olson were to struggle anywhere, it might be trying to get agency heads to support his agenda, said Charles Gerhards, who worked alongside Olson in Pennsylvania and succeeded him as state CIO. "The real question is how much empowerment you have to do the things you want to do. People don't volunteer to do things or give up control," said Gerhards, president of Gerhards Consulting Group LLC of Harrisburg, Pa.